My nephew, Christopher, lies in the ICU of a southern California hospital tonight. My brother, who is his father, refuses to leave his side; Christopher has a mass that has grown into his brain. It was diagnosed earlier today in the ER, after Christopher, complaining of a headache, collapsed. Emergency surgery has been scheduled for tomorrow morning, 7:30 am Pacific time, Sunday August 14th. Even if all of the Gods of Airline Travel were to cooperate tonight, it is too late for me to get there. There are no more flights tonight. There is no way for me to arrive before the surgeon's knife makes the first slice into Christophers' skull. Even if I were there, there is little that I can do but stand around and feel helpless. However, I need to be here too; Twinks needs me here, and we have to leave for another trip to Hospital City again in less than 72 hours, for Twinks to be fitted with her new braces. But I still wish I were there. I wish there was a way that I could reach out to my brother tonight, and hold him, and tell him that Christopher will be OK. 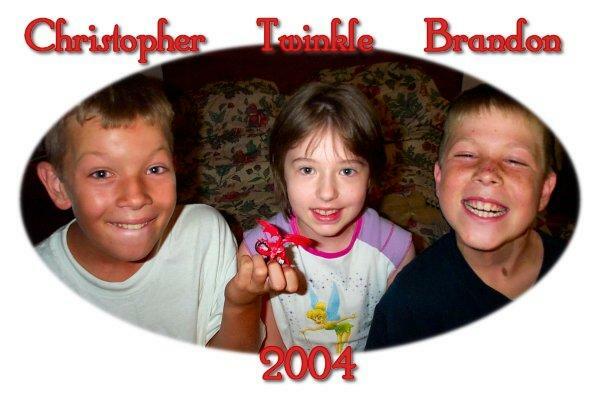 I wish that I could hold Christopher's little brother, Brandon, and tell him that his big brother will be fine, that in a week or two everything will be right back to normal. I want to gather Christopher in my arms, and tell him to hold on, and be brave and strong. What makes this all so much more difficult is that just over a year ago, on July 4th 2004, my brother's wife died. She was standing at the kitchen sink, and they were getting ready for a family barbecue. People had started to arrive; the boys were playing in the kitchen while she worked. My brother had run to the grocery store on the corner to grab a few things they had forgotten. When he returned from the store, the ambulance was blocking the driveway, and the paramedics were inside performing CPR while the boys stood in shock, watching. Her aorta had ruptured; she never had a chance. We marked July 4th this year with a celebration of her life, and a celebration of their completing a journey through this terrible, lonely first year without Wife and Mother. All of us had hoped that somehow this next year would be better, easier. Twinks is devastated; she could hear my side of the conversation, and knew that her cousin was in trouble. She wants to go too - she wants to be there when Christopher comes back out of surgery, to tell him that she knows what it is like to hurt, but that it will be OK.
Christopher is twelve years old. He has bright blue eyes, a shock of thick, blonde hair, and the sweetest smile in the world. He loves to play baseball, Yugi-Oh, and to go bike riding. You guys have had one tough month. My family is praying for Christopher, and the rest of you too. I will pray for your brother and his family. Prayers and lots of positive thoughts coming your way. I will say prayers for Christopher. May God bless all of you. It hasn't stopped for you guys.